All surfaces to which Gurtex SG-338 is to be applied must be sound, stable and free from dirt and loose debris. The product can be applied to a damp surface. Gurtex SG-338 is applied simultaneously spraying through a twin-nozzle spray machine. Nozzle A: discharges the SG 338 – artificial natural rubber latex and asphalt emulsion. Nozzle B: discharges a water base Calcium Chloride Additive. The product should be thoroughly mixed before using. At high pressure the result is a solidification of a dense latex and bitumen emulsion. The waterproof film forms and sets rapidly in 5 seconds and is resistance to piercing. It has very high elasticity – it can stretch to ten times its length and return to original size. Complete curing time is 24 hours. Spray-on applications are suited to all types of buildings and structures to waterproof the surface, improve the look and prevent corrosion. 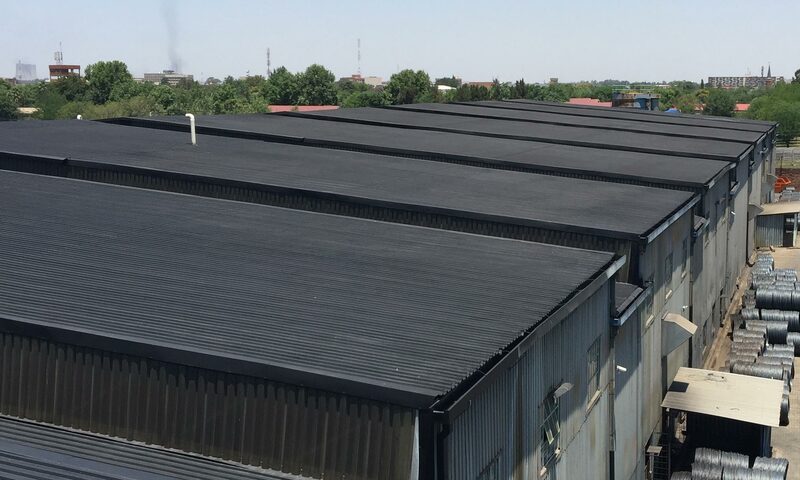 It is the ideal solution where leaks are the result of material deformation, heat expansion, cracking, piercing (installation of roof fixtures), loose joint mountings and rust corrosion. Spraying is fast and efficient – one operator can cover up to 1500 square metres per day. Spray a quantity of + 2.5 kg per square metre to obtain a 1.5mm layer. Gurtex SG-338 is available in 200 litre drums. Store in sealed container under cover out of direct sunlight and protect from extreme temperature.